Americans are divided over how much of a threat foreign governments present to America’s election system. Close to half the public (45%) believe that outside interference from foreign governments is a major problem for the current election system. Thirty-five percent of Americans say it is a minor problem and 17% say it is not a problem at all. However, more than two-thirds (68%) of Democrats say foreign influence is a major concern while only 22% of Republicans say the same. Forty-three percent of Republicans say it constitutes a minor problem while about one-third (32%) of Republicans say this is not a problem at all. Among Democrats, only 23% say this is a minor problem and seven percent say it does not present any problem for the election system. There are also wide differences of opinion between Americans of different racial and ethnic backgrounds. 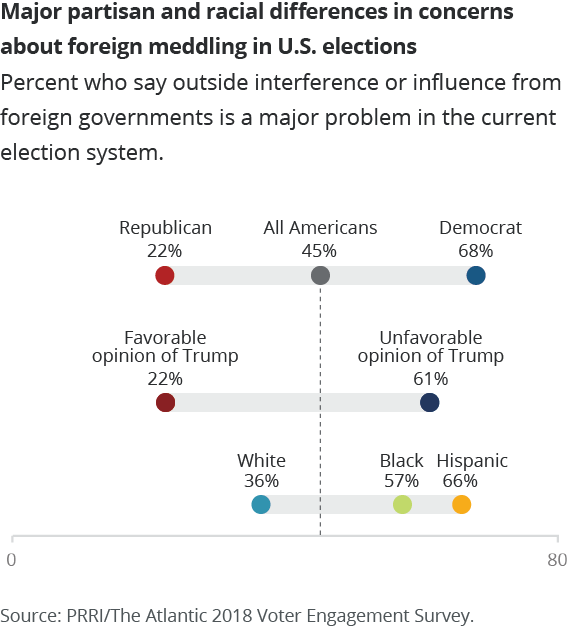 A majority of Hispanic (66%) and black (57%) Americans say foreign meddling is a major issue while only 36% of white Americans agree.